One woman. Six men. Stranded on Mars. Can they survive? It's been one month since Louise's men awoke. Slowly, they're finding a routine in keeping the station going. It's not easy, but they're getting by... until communications with Earth break down. Suddenly, they're on their own, and things that should have stayed hidden creep to the surface. Will Louise's men be able to help her get rid of her ghosts? We thought everything was perfect. We had our own planet, the freedom to do whatever we wanted, the resources to survive. And our family. My six men and me. Unconventional, strange, and utterly amazing. I never thought I could feel this much love without exploding, but it worked. For the first time in forever, I was happy. There was no news from Earth, but we thought we didn't need them anymore. We'd made it for six months without contact. But of course, happiness never lasts. And when happiness disappears on Mars, disaster strikes. I read this series in the box sets. I have been drawn in and become attached to the characters and their stories. I know that I&#039;ll be reading all 3 books again. Found the storyline exciting, and refreshing. I would highly recommend these books! I received a free copy of this book via Booksprout and am voluntarily leaving a review. Mars - The Ultimate Test by Michelle S The Mars Diaries The complete trilogy plus an exclusive short story Skye MacKinnon I thought these books were great. They were a little short - but they were novellas so that was to be expected. I loved that the whole trilogy was in a box set so I could read them all at once so that made it a little better. I think Louise was a strong character that did what she needed to do in order to survive being stranded alone on mars after the virus wiped out her crew. She was resourceful and amazing. 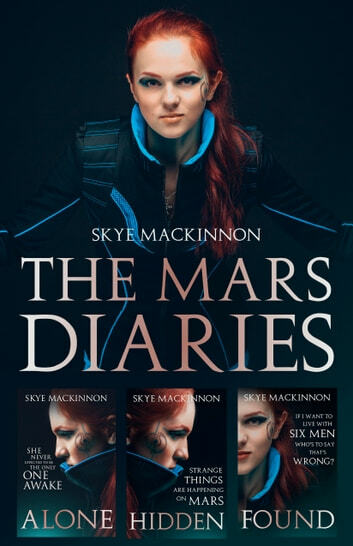 The world that Skye MacKinnon took us to was full of wonder and imagination that let us see a different universe that we might one day see in a few generations. They are stranded in mars. One woman and six men. How will they survive such a hostile environment? Can they find each other? Could bring a team help? See how they get on through three great stories. I received a free copy of this book via Booksprout and am voluntarily leaving a review.